The founder of the line Sakakiyama Koshirô I held this name from 1693 to the 6th lunar month of 1747. The actor Sakakiyama Sagisuke held the name of Sakakiyama Koshirô II from the 11th lunar month of 1747 to the 10th lunar month of 1766. The actor Sakakiyama Koshirô III held this name from the 11th lunar month of 1766 to the 7th lunar month of 1767. Born in 1740. Younger son of Sakakiyama Sagisuke, he started his career at the age of two as a koyaku actor in Kyôto, performing under the name of Sakakiyama Shintarô. 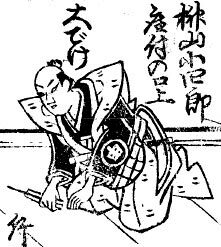 His next stage name from 1753 to 1759 was Sakakiyama Jûtarô II. He also held the name of Sakakiyama Yasoji from 1759 to the 10th lunar month of 1764. He took back the name of Sakakiyama Jûtarô II in the 11th lunar month of 1764 and took the name of Sakakiyama Shirotarô III in the 11th lunar month of 1766, playing in Tenmaya Kyûshichi's kaomise drama "Umayadogimi Shitennôji Kuyô", which is produced by Edosaka Kyôemon at the Kitagawa no Shibai. 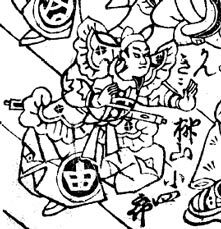 His brother died the 2nd of the 7th lunar month of 1767 and he became the heir of the Sakakiyama clan, taking in the 11th lunar month of 1767 the name of Sakakiyama Koshirô IV at Hayagumo Chôdayû's theater. His father Sakakiyama Sagisuke died the 9th of the 1st lunar month of 1768 but he unfortunately did not survive him for a long time because he died the 7th of the 3rd lunar month of 1768. His brother's disciple Sakakiyama Shirotarô IV became the sole survivor of the clan. Dates of birth and death unknown. This actor started his career as a disciple of Yamashita Kyôemon III, who gave him the name of Yamashita Koshirô. He was adopted by Sakakiyama Shirotarô IV in order to secure the future of the Sakakiyama clan of actors. He took the name of Sakakiyama Koshirô V in 1793. 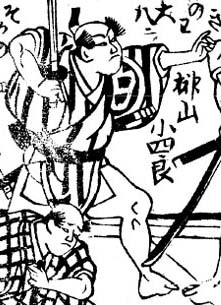 He spent most of his career, up to 1815, performing only in miyaji shibai. He was the adopted brother of Sakakiyama Shirotarô V.